The Howard-Carter Chapel offers a place of peace and comfort to the families we serve. The altar area includes both a piano and organ to accommodate musical needs. Many families choose to show video tributes to their loved one and we have technical equipment as well as a “drop-down” screen to meet this need. Our Chapel seats approximately 130 persons and utilizing other adjoining areas, we can comfortably seat 300. Those seats that do not have direct visual contact with the Chapel are accommodated by a large screen monitor, which the service can easily be seen and heard. 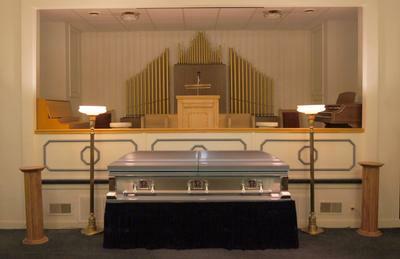 During Funeral or Memorial services, families can be seated in the family room where they can easily see and hear the service while maintaining their privacy. Our foyer is comfortably furnished and offers space for guests to sign the registers and congregate prior to entering the Chapel. We have ample parking to accommodate your services.